Nothing is more festive on campus than homecoming. I have enjoyed this time of year since my days as a student in the late 1970s, and I still get the same kind of thrill all these years later. This year was particularly special because it was my first since becoming chancellor. Blue Devil Productions does a great job year after year organizing fun events for students, including the soapbox derby, hotdog eating contest, medallion hunt, Couch-a-thon, comedians and the coronation of the king and queen. I also enjoyed URec’s 10th annual Blue Devil Run/Walk. New this year was the Alumni and Friends Tailgate Party before the game. As fun as homecoming is, a committee is working on plans to make it even better and to include more alumni, faculty and staff and the community. Bringing back the parade is on the table. Thanks again to everyone who helped pull off a great homecoming, and let’s make next year’s event bigger. One of the highlights of last week’s Board of Regents meeting in Stevens Point was the presentation that Randy Hulke, Discovery Center director, gave to the board’s Research, Economic Development and Innovation Committee. Randy laid out statistics showing that the Discovery Center, including the Manufacturing Outreach Center, is really making a difference for business and industry in western Wisconsin and across the state. Here is a slide from that presentation. I had a chance last week to visit with Diane Simon, executive director of the Dunn County United Way, Mary Hopkins-Best, our representative on the United Way’s Board of Directors, and Joylin Munro, a UW-Stout student who just started on the board. I was privileged to participate in a ceremony last week acknowledging the improvements we have made in our campus safety efforts. The Safety and Worker Compensation Committee last year proposed a safety incentive program for employees within our Physical Plant, Procurement, University Dining Services and Police/Parking departments. If they didn’t have any lost time to injuries they would receive a coffee mug, etc. We completed our first year of this program on Sept. 30, and we saved $108,000 in worker compensation costs. The four departments involved in the safety incentive had no lost time accidents. 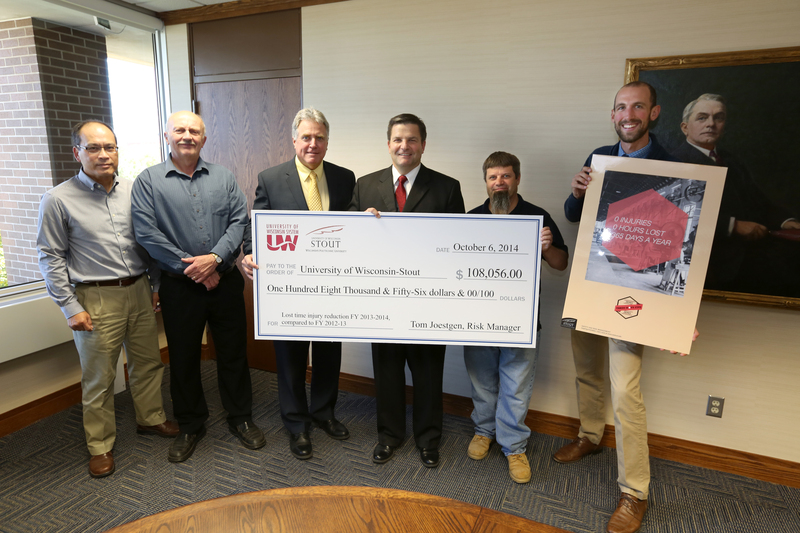 A check symbolizing the money saved was presented by Tom Joestgen, UW System risk manager. This entry was posted in Updates on October 13, 2014 by University of Wisconsin-Stout.